“Earl, over this year I have found you to be an excellent guide. Flexibility with program delivery, availability, impeccable instruction and a very encouraging and laid back rapport with students, characteristics which make our trips great. I look forward to next time.” – Rubin Thompson, Marion College, Ararat. Why Rock Climb and Abseil? Awareness, self-confidence, communication and trust are important for a student’s development. Come to nature’s classroom and allow your students to work together in a safe, enjoyable atmosphere. For many years outdoor courses in climbing and abseiling have helped facilitate new insight, knowledge and breakthroughs for students groups. The self-awareness and character building a student can develop on any session are significant for personal growth. In the climbing environment the use of communication, support and encouragement help an individual achieve heightened success. These skills, when used in a common environment will help students reach the same success in life. The time a student has on the rock will create an experiential learning that they will take with them through their life. Since 2002, Hangin’ Out has many successful years of experience facilitating school groups and working with staff to provide a quality service that is rewarding to students, staff and ourselves. We are passionate about sharing our love of climbing in the Grampians and aim to deliver an enjoyable experience that focuses on personal development and achievement. With our high level of safety without injuries or incidents you can trust Hangin’ Out to deliver a safe experience. All groups have a maximum 1:9 instructor/student ratio and all safety equipment is supplied, as well as climbing shoes. 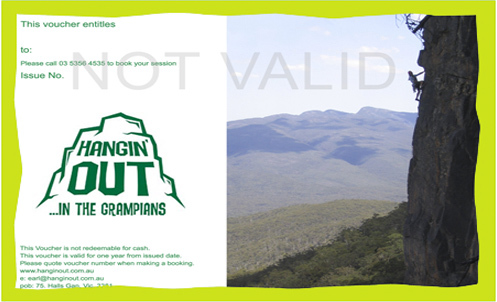 Hangin’ Out is fully accredited by National Parks (PV#1599) and ACIA (Australian Climbing Instructors Association), and endorsed by Tourism Victoria and Tourism Australia. As per Parks Victoria standards, Hangin’ Out is fully insured with the appropriate $10 million public liability insurance. Our programs are flexible and we can customise the course to your needs and desired outcomes. Programs can be run any day of the week. All guides have First Aid level two, either an Australian Climbing Instructors Association (ACIA) or Professional Association of Climbing Instructors (PACI) qualification, or both, and have minimum of two years experience guiding in the Grampians National Park. Apart from being professional, our guides are fun and friendly, helping to maintain high energy within the group and giving a very enjoyable and memorable day. Our permit covers the Grampians National Park and Arapiles-Toolan National Park. We typically run sessions from either Summer Day Valley or Lookout Point Wall in the Grampians. Located in the Northern Grampians, this is one of the premier climbing areas in Australia for group use. Situated 40km N of Halls Gap on the Mt. Zero Road, with bus parking and toilet facilities at the meeting place, the Hollow Mountain car park. A short 5-minute walk takes us to the climbing area which boasts a large number of climbs with a great variety of heights and grades. The memorable and typically character-building 22-meter abseil is set in a dramatic position over the valley in sight of the climbing area. With less chance of rain than the Halls Gap cliffs and exceptional rock quality, it is our favourite area to conduct climbing sessions and introduce people to climbing and the Grampians. The site is a safe area to work with groups and offers challenges for all abilities. Located in the Halls Gap area on the Wonderland Range at a similar height The Pinnacle, Lookout Point towers above the valley of Halls Gap. It has spectacular views and is a surprisingly good site in poor weather. The meeting place is the Sundial car park, a 15-minute drive from Halls Gap with bus parking and toilet facilities. A 5-minute walk takes us to the climbing area which also has a 22-meter abseil and offers 6 climbs from easy to moderate. The cliff works well for smaller groups and is best suited to year 8 and above, although younger groups have achieved great things. Lookout Point Wall has some of the most spectacular climbs that we instruct and some of the best “Kodak moments”. This site is a 4-hr walk from Halls Gap which can be an excellent option if your group wants to include a bushwalk on the day. Hangin’ Out offers competitive fees for student groups. Sessions include all safety equipment and climbing shoes. Pricing is based on group size. Please contact us to discuss the fees for your particular group. A half-day (4-hr) session enables students to get a taste for real rock climbing. They learn safe belay techniques, knots, and basic climbing communication. In addition, each student is given the chance to complete an abseil or two. Our 6 hour session is also offered to give ample time and opportunity for participants to experience the session with some more time to climb, abseil and most importantly to allow us a good moment to facilitate learnings from the experience. Alternatively a full day (8hrs) of climbing and abseiling may be preferred. A full day is more comprehensive; we are able to build upon the skills developed on a half day course giving the students the opportunity to take the day at a more relaxed pace to achieve higher goals, working on their movement on rock, communication, mental awareness and trust in one-another. While climbing can be challenging, no climbing experience is necessary and only basic fitness is required. Comfortable clothing that suits weather conditions, and wet weather wear if rain looks possible. Give someone special the gift of adventure! 18 years ago Duncan hand cut the stickers for the 1st Hangin' Out vehicle! 18 years later, great to see Duncan and family out climbing with us and his stickers now growing lichens on the abandoned van parked out in the bush. Withstanding the test of time, almost better than me! Thanks Duncan! Makes me laugh when hardly anyone is looking at the camera! After a couple of days with rain, here's a PB for me you won't find on Strava! In and on my 70lt back-pack is 6 WET 50meter climbing ropes, one 65meter static a few set-ups and a fist-full of steel gates! Baffled and confused we arrived at the crag on Saturday to this grit-like stuff at the top of the climbs we set up on. Why and how did it get here? Some had even made its way to the base where we start the groups climbing. Our many customers today and yesterday had no idea what it could be. It's taken a good 24hrs for me to work it out, but I believe I know what it is! Scott Walker guiding one of our student customers on Pharos Buttress. Arapiles! There's no wonder why it's a mecca for climbers. My favourite tree in the Wimmera and this one obviously a favourite for the farmer! A moment in time, the view from the office this morning.